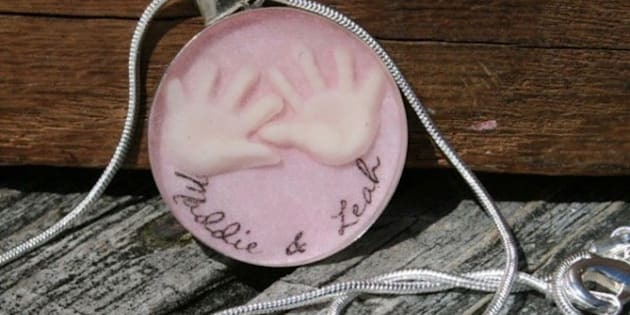 Breast Milk Jewelry: Are Mommy Milk Pendants Gross Or Touching Momentos? NEW YORK, N.Y. - Strands from baby's first haircut. The first tooth. Tiny footprints sunk into clay. Some parents even tuck away the dried stump of the umbilical cord or the stick pregnancy test as a touching memento marking the milestones of their kids. The latest? Breast milk jewelry. Few issues polarize mothers more than breast-feeding, and all things related to breast-feeding, so wearing processed breast milk around the neck or in a bracelet has ignited some passions. The jewelry, on sale at the handmade marketplace Etsy, is definitely not for writer Ashley McCann, 34, in Naples, Fla. She nursed both her boys, 6 and 9, and loved it, but she feels some sort of gross-out line has been crossed. "This is the most hilariously absurd trend in mommy jewelry that I have ever heard about in my life," she said. "I think it is just flat-out weird, to be honest." In addition to finished jewelry, a search on Etsy produces sellers of breast milk soap and one offering a locket kit for the DIY inclined. A couple purveyors, both moms, said in interviews that they hit on the idea as they sought out unusual keepsakes of their special bonds with their babies during nursing. The two would not reveal their recipes for processing the milk, which is covered with a glaze or clear resin after it is plasticized or dehydrated, forming a clay-like substance that hardens over time when at least one method is used. Prices range from $15 for the kit, which includes various locket designs, to $125 for a double pendant in copper bezels with a matching vintage chain. "What a wonderful way to preserve the 'liquid gold' that we are only able to make for a certain period of time," reads the product description for the latter. "This can be passed down for generations and what a fantastic gift to give to your child, the root of their survival." The passing down notion prompted more than a few jokes on BabyCenter.com when the subject first came up innocently enough in January. A poster on the site, which has an average 11 million unique views a month, said she had heard of breast milk jewelry and wondered where she could find some, said Rebecca Michals, who manages the message boards. "It may not be for everyone," Michals offers. "I think it's a matter of opinion." Oh yes. Just as attachment parenting (wearing your child, the family bed) is a matter of opinion, or nursing in public, or those breast-feeding baby dolls of the holiday season last year. "I actually think it's the attitude behind it," McCann said as she tried to explain her disdain. Nursing, she said, "is one of my fondest memories, and honestly I would get pregnant again to nurse another baby. But it was the relationship. There's something about plasticizing breast milk, which is just food to nurse your baby, that almost seems like some sort of weird worship of nursing." Tell that to the 20 or so people who contact Allicia Mogavero each day about the breast milk jewelry she began selling in 2007, then mostly to friends. She put her designs on Etsy about a year ago and has sold about 200 pieces, including pendants, bracelets, lockets and beads of breast milk alone for people to do with what they wish. She personalizes the jewelry with names in fancy script. In all, she offers 36 items, using a five-step process to preserve a small amount of milk shipped to her as instructed. Working the milk takes about four weeks and the resin needs a week or two to dry, she said. Mogavero, 34, in Wakefield, R.I., said sales have picked up since the jewelry arose on BabyCenter, producing dozens of posts that seem evenly split between admirers and the repulsed. "A lot of people are repelled by breast-feeding in general, as crazy as that is. And I think anything having to do with it is probably not anything that they like. It is a body fluid, so maybe that's why people are somewhat against it," mused Mogavero, who has shipped to the Philippines, England, Australia and Japan. Mogavero said she has had husbands steal breast milk out of the freezer to surprise their nursing wives with one of her creations. She sells on Etsy as MommyMilk as she continues to nurse her third child, a 16-month-old girl. Brooke Becker in Summerville, S.C., offers the breast milk kits on Etsy under the user name MilkMomBaby. "I think initially you tell some people about it and they say, 'Oh, that's gross,'" she said. "Breast milk is pretty personal. Just sending that off to someone is a little bit of a leap for people." That's why she decided to sell kits, including discreet lockets and a pill box design as vessels. She said she has sold about 48 kits since October. "It's something that moms do for themselves," said Becker, 33. She has shipped to the United Kingdom and Asia. "It's more for mothers who are nursing long term, not people who just nurse a couple of months." Victoria Cameron, 33, is nursing her 13-month-old son and pursuing a master's in social work in Minneapolis. She went on Etsy in search of mother's jewelry when she stumbled on the breast milk sellers. She was the first to post about it on a BabyCenter board for bargain hunters. The quick-fire reaction surprised her. "At the same time people were talking about getting cremation remains made into a diamond or a rock, and that was, like, super meaningful, and then people were just like, 'Oh this breast milk thing is crazy.' It was very odd," she said. The debate has since spread on parenting blogs and social media. In Belleville, N.J., Sharon Valcarcel, 32, nurses her 11-month-old daughter in the evenings after she returns from her job as a high school psychologist. She heard about the jewelry from a friend and thought it was "kind of gross." The jewelry, Valcarcel said, plays into broader divisions over breast-feeding, with women "who are very elitist" about it on the supportive side. "The funny thing is they're kind of pretty," she said of some of the designs. "But I think it's awkward." Cameron hasn't bought a piece of breast milk jewelry but plans to "as kind of a weaning type of thing, when I think we're getting towards the end of it." "This has nothing to do with promoting the breast-feeding campaign. This is people on Etsy wanting to make a buck, and emotional moms like me wanting to have something for themselves," she said. "I'm not going to pass it down to my son. I'm not going to tell the average person on the street what it is. It would be for me."